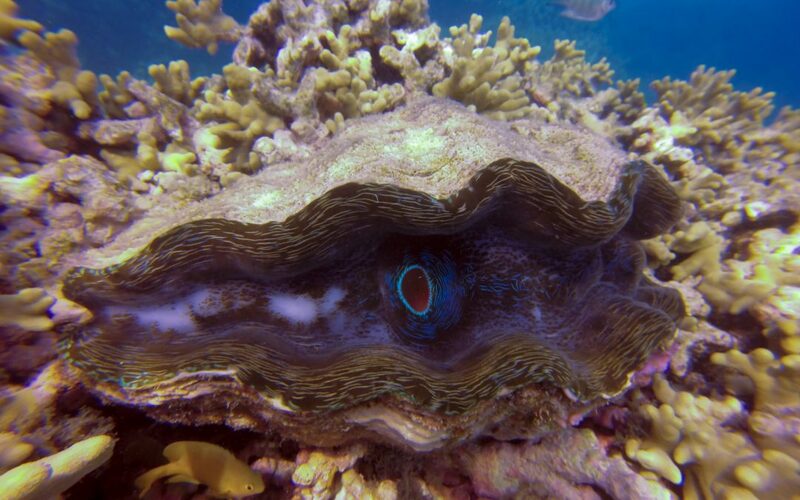 The Giant Clam is found at our very own Lady Musgrave Island Lagoon part of the Southern Great Barrier Reef, with the Giant Clam earing its spot at number 5, alongside the likes of Whales, Manta Rays, Clown Fish, Sharks, Potato Cod, Maori Wrasse and Turtles. Lady Musgrave Island is one of the only locations along the Great Barrier Reef where all 8 can be found, including of course the amazing Giant Clam. It’s said that, like a human fingerprint, no two Giant Clams have the same colouration or mantle pattern. These wild technicolour effects actually come from algae living within the clam’s tissue. These extraordinary mollusks, which can grow to 1.5 meters in length and weigh up to 200 kilograms, feature a pretty ordinary exterior but a stunning mantle – the fleshy part protruding from the shell. One of these Clams is not like the other…. Adult giant clams cannot close their shells completely. This makes them the only species of clams unable to do so. By nature, Giant Clams are hermaphrodites. They possess the reproductive organs of both the sexes. Despite this, they cannot reproduce on their own. On the contrary, they release sperms and eggs into the water. A single giant clam can release over 500 million eggs at one time. The algae that grow within the Giant Clam’s mantle tissue are their main source of food. The giant clams absorb sugars and proteins, which these algae produce as they photosynthesize. The nutrition that they get from these algae enables them to acquire such enormous sizes. Owing to their immense size and their sessility, giant clams are also preyed upon by a number of predators which are, more often than not, much smaller than them.